Hey guys. 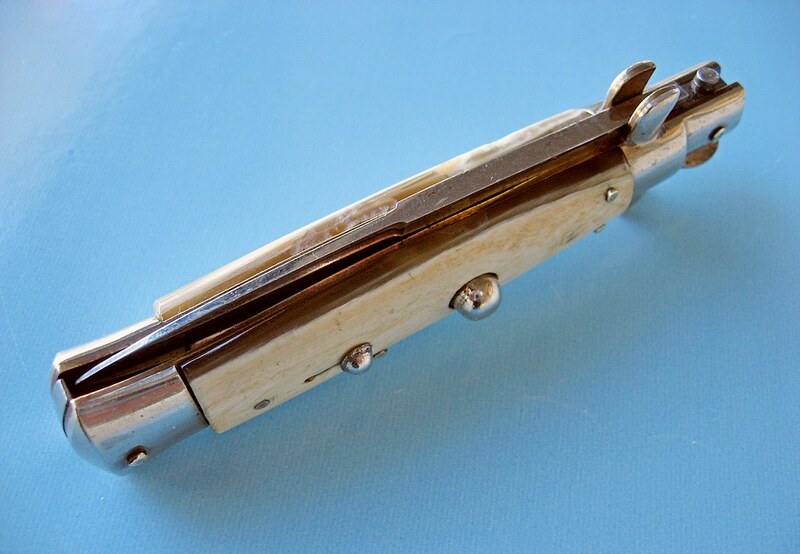 Coupla recent finds: an 8" leaf-spring humpback and 7" picklock. The humper has Rostfrei on the front and Patent 77431 on the back. It has lined nickel silver bolsters and a D-stamped liner, and while the blade is stainless, the lockbar, backspacer, and kick-spring are carbon steel. 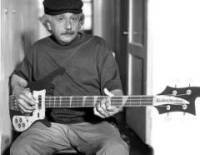 Is that combination unusual? I like the low button placement and the short-throw safety. 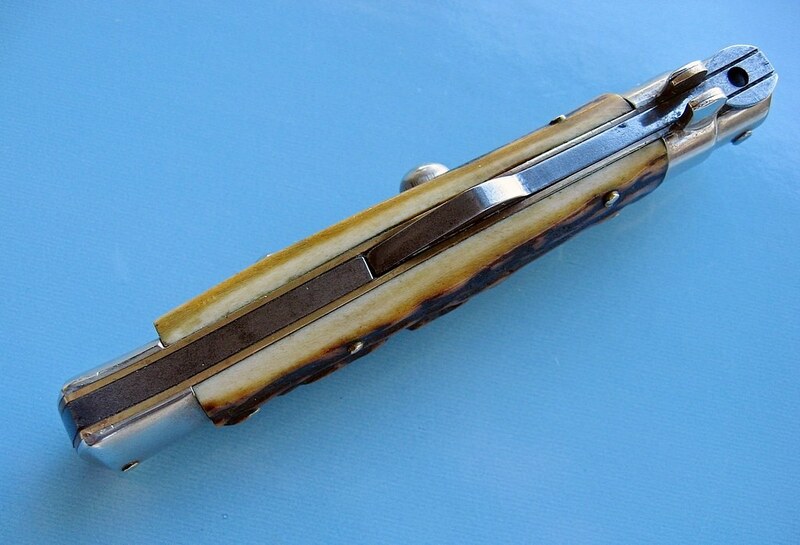 The little carbon steel picklock in unmarked and has some unusual (to me) old horn in that it's kinda ivory-colored on top with a dark greenish-amber substrate. 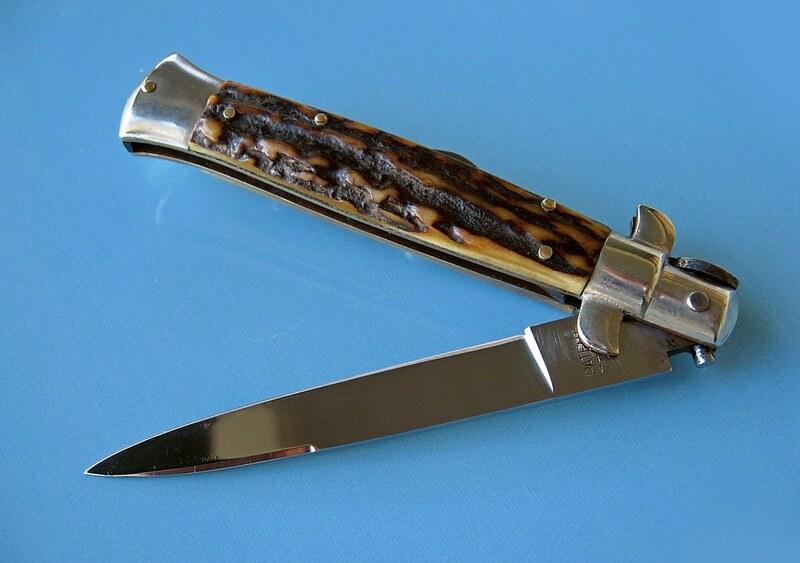 I've seen photos of horn like that on older picklocks, but I've never seen anything quite like it on recent knives. Unfortunately, the rear scale has seen better days. Dermestid beetle larvae really dig Italian food. Eh, what the heck, I got it for pennies a serving, so I don't feel too bad. Great finds, speaking of the patent #, I just got an old humpback lockback ( wish it was an auto) that has that same patent 77431 on it that has ALAMO Italy on the front.... pretty much its the manual version of yours but with horn... and in no where near the great condion that yours is in. Very nice, love the humpback. 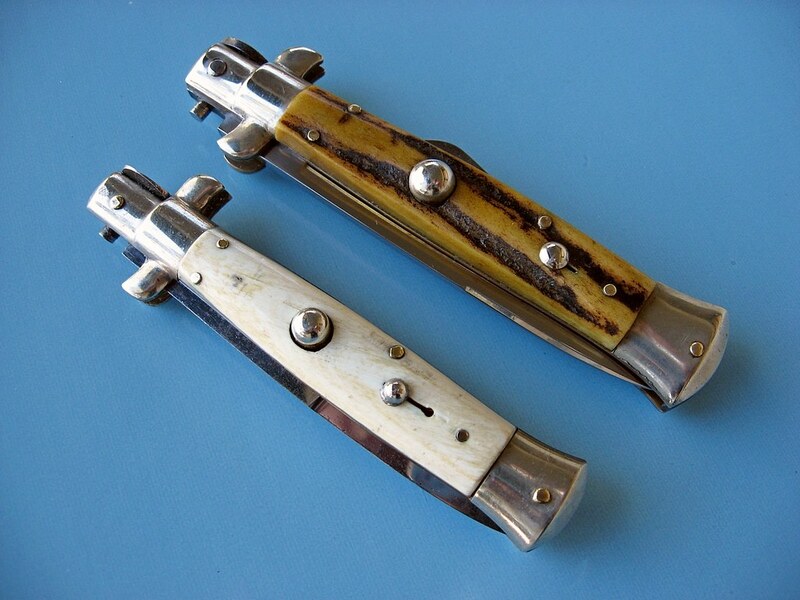 Regarding the patent number, I've seen two Italian humpback patents; 68586 dated 1961, which is a lockback with the release hump just above the rear bolster, and 77431 dated 1959, which is the mid-lock version shown above. Last edited by Corvus on Tue Feb 12, 2019 3:32 am, edited 1 time in total. I have a tarry levigne transitional with similar white/yellow horn scales and it too is badly bug bitten .They must really love the stuff as you say. Any ways of filling it ?,I am sure I read of layers Superglue being used somewhere here. Thanks for sharing those two. I'm digging that little humper! 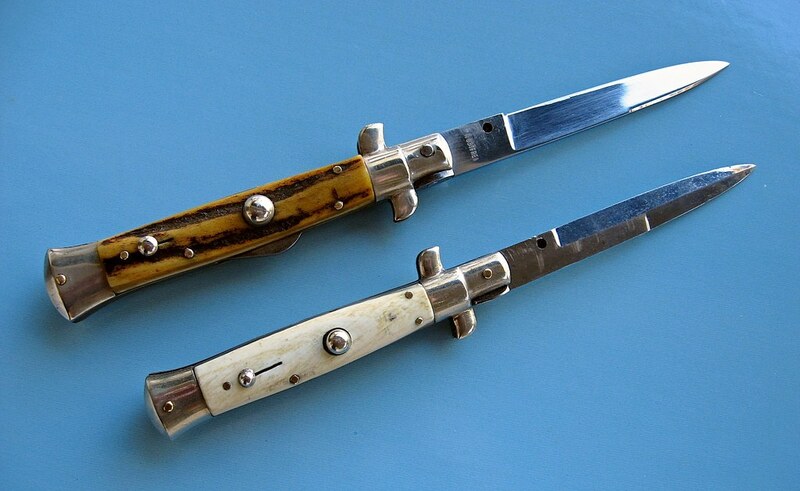 Actually, it's unusual for Italian stilettos to have anything OTHER than carbon steel backspring/kick springs. Stainless doesn't readily make good springs. Even modern stilettos use carbon steel for these parts. Only the blades are stainless. 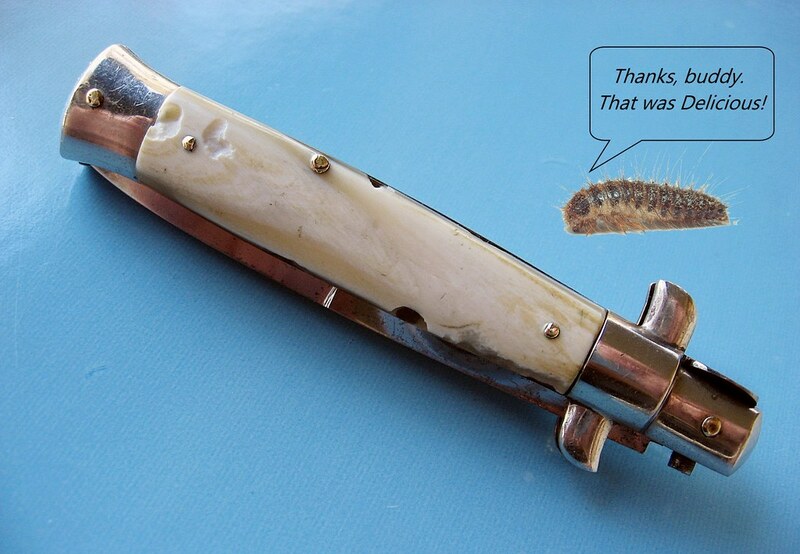 Your picture of the rear of the knife is funny! I can replace the horn. Regardless of what one guy will tell you- horn repair might look excellent when it's finished, but in a year or so, the horn loses it's luster-but the glue doesn't. The repair then becomes terrible looking. While I do some minor repairs to horn handles, it's only on small spots for this reason.